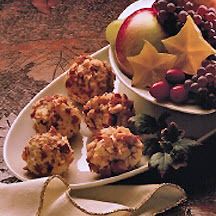 Serve these creamy camembert and almond appetizer balls with crackers. Soak cheese wheel in wine for at least eight hours or overnight, turning cheese occasionally. Drain wine and discard. Press cheese through coarse sieve or food mill; blend with softened butter. Chill cheese mixture until slightly firm. Shape into small balls about 3/4 inch in diameter; roll in almonds.